Have your catalogs arrived yet? There are two - the large spring catalog with a Sale-a-Bration reminder on the front and the smaller one with the free exclusive "available only during Sale-a-bration" products. 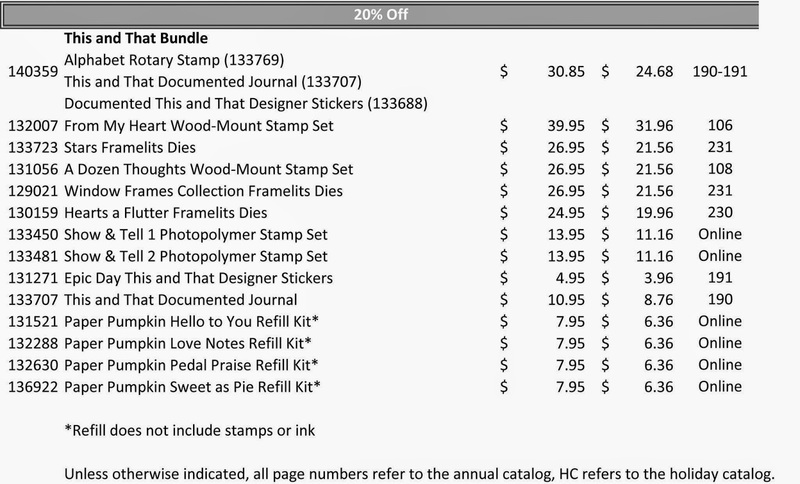 If you have not received the catalogs and you are not working with another demonstrator, just send me an email to oh2bstampin@yahoo.com with your mailing address and phone number to receive your personal copies. Why do we have TWO catalogs? The large spring catalog highlights the newest products available for purchase (beginning January 6th, 2015) and the Sale-a-Bration catalog highlights the free items you can receive when you place minimum $50 orders. For every $50 purchase, you can choose one free item...no limit!! These catalogs will also be available to view online on January 6th in the left column of this blog. 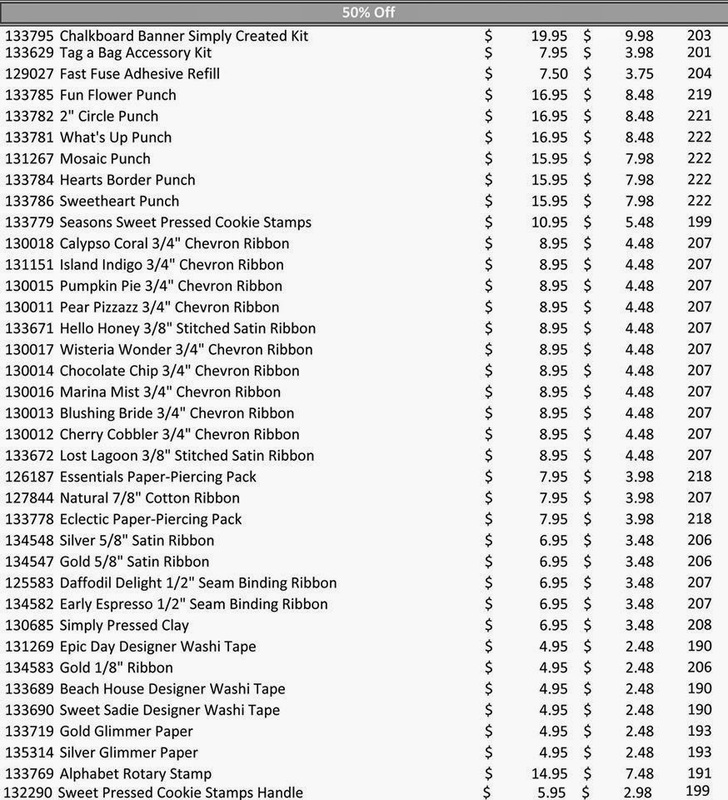 **Products from this year's sale-a-bration WILL NOT be seen again (unless someone who has them sells them). The Sheltering Tree - One of my favs!! There is soooo much more to come so be sure to check back on January 6th!! This is by far one of the BEST SALES EVER!! Here's just a small snippet of the Year-End Closeout Sale. Notice the Holiday Ornaments Framelit dies on the top row and the coordinating Ornament Keepsakes wood mount stamp set on the bottom row! 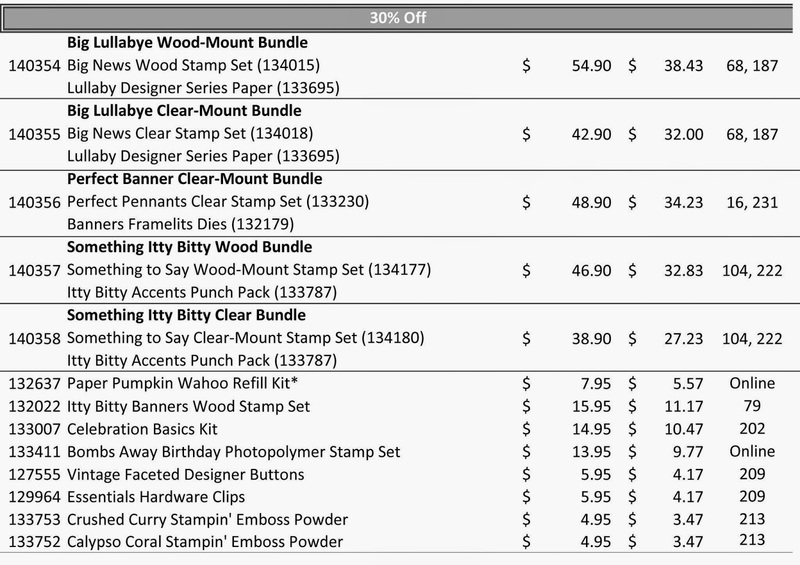 What stamper wouldn't want that duo in their stamping supplies and especially at THAT PRICE?? To see the entire sale, JUST CLICK HERE! Be sure to check out the Christmas stamp sets and don't miss the 2012-2014 Coordinations Paper and Designer Paper...it includes Gumball Green and Raspberry Ripple...excellent colors for your Christmas projects! In a hurry? No problem...the Merry Little Christmas Simply Created Card Kit and coordinating stamp set was created just for you...quick cards! As always, I am "at your Serviss" so if you have any questions, need assistance in ordering or if I can help you in any way, please feel free to email me or leave a comment. Today is a day of celebration for me...my grandson, Cooper James Davidson was born...content and healthy. I feel so blessed to be able to welcome him into the world. My heart is overflowing! so don't miss out! If you haven't already seen the awesome items on sale, check below...you'll find lots of super savings! My favorite item in the 20% off section is the Star Framelits Dies. You can use them for Christmas cards and ornaments and even boxes! And they'll come in handy on the 4th of July as well. My favorite item in the 30% off section is the Big Lullabye Wood-Mount bundle. The sentiments are large and perfect for card fronts. Makes simple work of card making and the Lullabye Designer Series paper is awesome with it's tiny prints to use on all kinds of cards...not just baby. It was a no-brainer to pick my favorite item at 40% off...it's the Big Shot Magnetic Platform. If you have a Big Shot and a set of framelits (we have a huge assortment), the Magnetic Platform is a MUST HAVE!! You will absolutely love it! Lots of punches on sale at 50% off! Gold and Silver glimmer paper is also 50% off. Great for holiday card-making. This is an awesome time to shop and save...wouldn"t you agree? When you have chosen the items you want to order, just CLICK HERE to go to my online store. This month's Hostess Code is KQRGH6QU. Please enter it in the box in the lower left corner just before submitting your order.